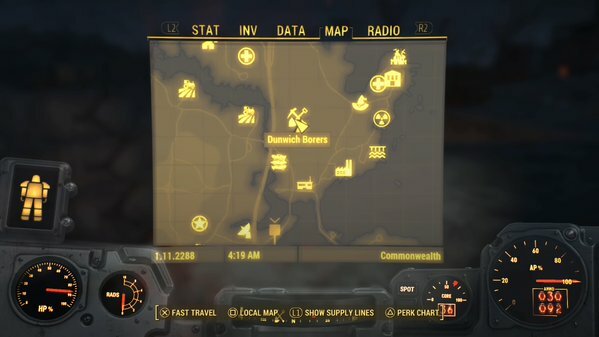 Dunwich Borers is located in the northeast of the Commonwealth, just to the east of the highway that runs through the area. It’s a relatively short trip west from the shoreline that dominates the eastern side of the Commonwealth. 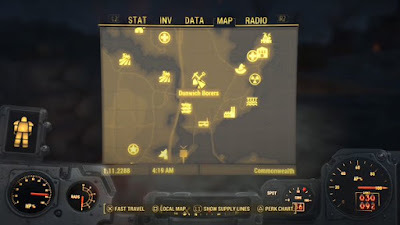 You’ll probably wind up out this way if you’re pointed towards the Museum of Witchcraft in Diamond City, though sheer exploration might get you here as well. The safer (and probably best) option is to go in with a silenced weapon and stealth through. It’s pretty easy to hide in the rocks near the top of Dunwich Borers and pick off enemies as you get progressively deeper, and so long as you take out the guys in the guard shacks overlooking the pit you shouldn’t be at substantial risk of being spotted. Speaking of the shacks, you can pop into the northern one and find a terminal that will shut down all of the Turrets. Handy! Snipe. You can see virtually everyone in the pit from above, and the width of the thing gives you plenty of opportunity to change your vantage point and shoot to your heart’s content. If you intend to remain hidden during this, make sure you move often. Try to take out the dude in the Power Armor first. Shootout! Yep, you can totally survive a firefight here, though you’ll want a position with lots of cover. Stay high in the pit and kill enemies with rifles from afar. A companion is useful in this case, as is Power Armor. Don’t go down into the pit until the only enemies left are at the very bottom. You won’t find much in or around the pit until you reach the bottom, and even then it’s rather easy to miss that this does not constitute the entirety of Dunwich Borers. Head to the west side of the pit and you’ll find a ramp down to a door. More fun inside! The dark pool of Dunwich Borers in Fallout 4. Don't hop down here in Power Armor, for the love of god. - Follow the path until you reach an elevator on your left. There’s naught but a locked door at the top, and you need a key to open it. We’ll come back to this. - Straight ahead the path widens a bit; there’s a Raider patrolling up here, and past him a larger room with a Turret and another guard. The latter two are ‘protected’ by an annoying light that can blind your aiming, so you may want to hurl an explosive and forego the need for accuracy. You can also use the terminal on your side of the room to turn off the Turret in advance. Watch out for a grenade trap if you use it, however. - Take a left at the stairs to the blinding light. There are stairs leading up and a ramp leading down. Up the stairs you’ll find another falling grenade trap, and, past that, a small Novice locked cell. Goodies wait within. You can also use the platform up here to snipe the Raiders that are beyond the bottom of the ramp. Be ready to face at least three of the dudes. This lot is guarding a small sleeping area with a variety of boxed items and a Weapons Workbench. - To the left is another Raider, keeping watch over a terminal and a circuit breaker. Throwing the circuit breaker will activate / deactivate several lights on the stairs leading down from here. Do with them as you will, though if you’re going stealth, you definitely want them off. - The Raider boss is waiting at the bottom of this last pit, along with one final crony. Take out both in whatever way works best for you, though I personally like lobbing grenades out of the darkness. Ammo and other items wait down here, and you’ll find a copy of Astoundingly Awesome Tales sitting on the Armor Workbench. - Head down the pathway from this small room to find a chained door. Pop through and you’ll find another area, this filled with the corpses of Feral Ghouls. The first few are definitely dead, but when you get to the bottom of the first ramp they’ll start to come to life. Be ready to defend yourself. Backing up the ramp will give you the best defensive posture. If you’re going purely stealth, you’ll avoid soooo much trouble just leaving the lights off from this point on. - A circuit breaker at the bottom of the next upward ramp will turn on lights at the top, illuminating more Ghouls. Take ‘em out, then go through the door on your left. Something… weird… will happen. Anyway, you’ll find another circuit breaker at the top of the next ramp, and it does what you might imagine by now. Flipping it will bring a number of Ghouls towards you, so be ready for a scrap. One of the lefts here will take you up a ramp, but we’ll come back to this. - The path splits to the right and left ahead. To the left you’ll find a small overhead catwalk of little use. (Some of the Ghouls are / were sitting up here.) To the right is an open room with another circuit breaker; ignore or use it as you wish, though using it stirs up more Ghouls. You can find some items on a ramshackle wooden platform to your right, and not far from here is another terminal. The terminal contains the Dunwich - Tim Shoots Holotape. Sitting beside the terminal is a Sneak Bobblehead. - There’s a ramp on the other side of the room, and something else weird will happen, leading into a battle against a number of named Ghouls. They will quickly rush you, and your best chance of an easy fight is to lob a grenade before they can get to their feet. Back up the ramp to kill off any survivors. Check the body of Tim Shoots for the Dunwich - Management Holotape. - A watery pit sits in the middle of this small room. You can jump inside it and swim to find a connecting tunnel near the bottom. Do not wear Power Armor down here! Unless your aim is really good you’ll be forced to abandon the damned thing. 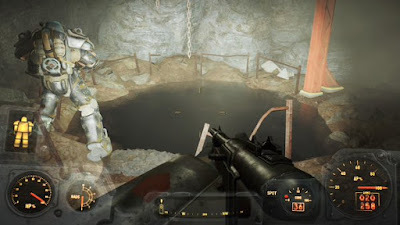 Through the tunnel is an underwater chamber, and inside, on a lit pedestal, you’ll find two Mini Nukes and a Kremvh’s Tooth, a pretty awesome melee weapon. - Get out of the pool before you drown (if you can drown) and make your way back to the first hall where you were encountering Ghouls. One of the eastern pathways in this hallway, which we skipped earlier, leads to a long upward ramp. There are inactive Ghouls on either side of the ramp, and they only seem to wake up if you shoot the trail of gasoline along the ramp. - At the top of the ramp is a small maintenance niche with another circuit breaker; activating this brings out, yep, more Ghouls, and they’ll be right in your face! Yay! Check this small area for some useful items, including some Stimpaks, then keep climbing on your right. - Up the next ramp is another circuit breaker, and, yes, it brings more Ghouls to life. Keep fighting them off until you reach some rusted stairs. Near the stairs is another small niche with a yellow explosives box; check the side of it for a trap before opening it up. At the top of the stairs you’ll find the body of a Raider, and on it is a Dunwich Borers Key. The Key opens the nearby door, which leads alllll the way back to the entrance. Woot.